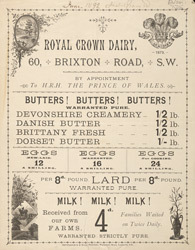 At the start of the 19th century, a good deal of the milk sold in British markets was of poor quality. It was usually kept in uncovered churns and very often contaminated by bacteria. To maximise their profits some farmers even added water, so the milk was very weak. In 1872, Parliament passed the Adulteration of Food Act, which helped to put a stop to this practice. However it was the conditions in which the cows were kept that caused the majority of problems. Unsanitary conditions meant that dirt and disease often contaminated the milk before it even left the farm.